Online measured biomass data can be correlated with parameters like optical density, cell dry weight, or cell concentration. This way it is possible to get real-time information on e. g. OD600 development. The device optics can read out pre-calibrated oxygen and pH sensor spots - integrated in the ready-to-use cultivation vessels - and also comprise a dedicated optical set-up for biomass monitoring. 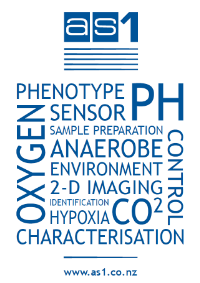 The oxygen uptake rate (OUR) can be calculated from the slope of the online oxygen measurements. The system has two long-lasting, rechargeable batteries, and is compatible with any standard shaking incubators. Up to 4 SFR vario can be controlled from the SFR vario software. Measurement data is transferred wirelessly via Bluetooth to a PC / notebook. The new SFR vario is the sole system on the market for simultaneous online measurement of biomass, O2, pH & the oxygen uptake rate (OUR). The application note "New Device for Biomass Monitoring in Shake Flask Culture" shows how your work with microbial cultures will benefit from this new device. It allows to measure 4 vital parameters in up to 4 shake flasks in parallel. The fact, that O2, OUR, pH and biomass functionality can be purchased separately minimizes your investment to the actual need. It is the combination of functionalities which makes the SFR Vario very interesting for media evaluation as well as process development and optimization ... and all this without sampling. Please note that for the first couple of months the matching SFS shake flasks will be sold as prototype sensors. Contact Anna to see if this has changed or if you would like more information about the SFR Vario in New Zealand and Australia. Presens answers Frequently Asked Questions include how to test the stability of a sensor of an organic solvent and how to incorporate an optical DO sensor into a minibioreactor with an 8mm or a 6mm fitting.